A list with media originating from, or involving, the Philippines. Note: This list may include works or personalities coming from the Filipino diasporathat is, Filipinos who live and/or regularly work outside the country. Much as with the Jews, the Chinese, the Irish or the Polish, the diaspora is an essential concept in Filipino society, with millions going abroad either to send back aid to their families or to migrate and seek greener pastures. As such, if a work is produced in a foreign country, but primarily by people of Filipino descent, the priority is to count it under "Filipino-created" media, rather than "foreign media about the Philippines/Filipinos". In addition, the list of Filipino characters and settings in foreign works may include examples not explicitly stated to be Filipino per se, but have strong implications or circumstantial evidence pointing to that conclusion (for instance, an Asian character with a Hispanic name, is Catholic, and comes from an unnamed tropical Asian country). If the general fan consensus, Word of God or not, agrees that the character or setting is most likely Filipino, then it may be considered on this list. The planned Trese Animated Adaptation on Netflix. One of the main character circle in The Gilded Wolves (due out 2019) by YA author Roshani Chokshi (who herself is half-Filipino, half-Indian) is Enrique, a Spanish-Filipino ilustrado (intellectual) living in Paris in 1889. "The Legend of the Dying Wanton"
Music note If the musician/s in question are also active in other performing arts such as acting for film and theatre, or even voice acting for animations or games, please consider putting them under "Performing Artists". The Crocodile God, an Urban Fantasy about the Reincarnation Romance between Fil-American Mirasol and Haik, the title's Tagalog crocodile-god, who is revealed to be an undocumented immigrant. The Death of the Old Gods (both figurative and literal) features heavily in the story's precolonial Mythopoeia. The SNARLED webseries Something Scary, a largely one-woman production about horror stories and urban legends, directed, written, hosted, and animated, where needed, by Sapphire Sandalo, Filipino-American content creator and part-time animation professor. Also created by Sapphire Sandalo: the animated webseries School Spirit, featuring a university apparently haunted by ghosts, and where Sandalo herself voices Hazel, the sceptical protagonist, as contrasted with her friend and roommate Gem. The Nutshack was an animated series intended for Filipino-American audiences; its main characters are Filipino-American. The show became infamous for its overall quality, especially its So Bad, It's Good theme song which reached Memetic Mutation, causing it to get an ironic following. Blade had an episode set on the supernaturally active Siquijor island, and features Blade seeking the help of three indigenous hunters (Lupit, Cimarron, and Hagibis) to take down a manananggal (a winged, vampire-type creature that can split its body in half). Looks like Grimm wasn't the first one. Black Lagoon mentioned and visited some Philippine places a few times. It's bound to happen given the characters are mainly based in a Southeast Asian Wretched Hive. Though it's never stated outright, there's a strong implication that Maria from Sayonara, Zetsubou-Sensei is of Filipino origin, based on her Hispanic-Catholic given name, her dark complexion relative to her classmates, and a bio stating she's an illegal immigrant who sneaked into Japan from what's only described as a neighbouring, poverty-stricken, war-torn country. 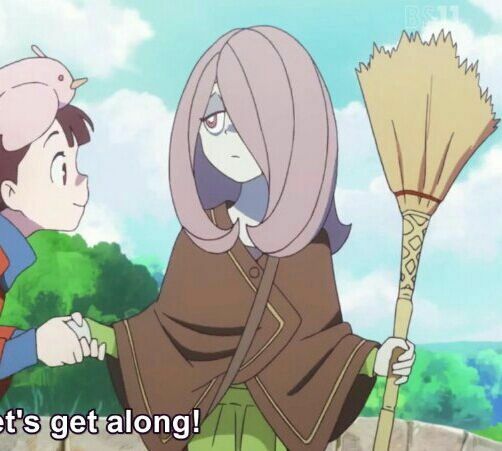 Sucy Manbavaran from Little Witch Academia, one of Akko's close friends, who is also pretty strongly hinted to be Filipino: her Establishing Character Moment depicts her carrying a ◊ walis tambo  a flat, Philippine-style Flying Broomstickand her last name is a modification of the Cebuano term mambabarang, one of the local terms for actual witches or practitioners of dark magic (specifically, those who summon insects and other vermin to plague their victims). The Manila Shawl , a 1911 painting by Henri Matisse, depicts a woman in a shawl made with light, translucent Manila fabric. Russell Peters has done a few Filipino jokes, mostly ribbing on their thick accents, the family tradition of forcing kids to sing and dance, and the similarity of Manila's heat and traffic to Indian cities. He also brought the Deported World Tour to Manila in March 2018. Steelgrip Starkey and the All-Purpose Power Tool featured a Filipino programmer named Sharri Barrett as part of the main cast. The Triumph Division, the Diwatas, and the newly-released superhero Wave in the Marvel universe. Fan Worksnote By extension, any fanwork derived from the other media on this list actually counts, provided said fanwork also significantly includes the preexisting Filipino characters/settings in their own plots, or else adds new Filipino original characters and/or setting. Maaf, an Indonesian doujin in the style of Axis Powers Hetalia about the personifications of Southeast Asia, Australia and New Zealand, as well as all their colonisers. The mangaka devotes a lot of detail to the precolonial personifications of the Philippines, which she laments has lost most of its precolonial and indigenous culture and history due to the extreme influence of double colonisation by Spain and the U.S.
Several American films about the American-Japanese battles in the Philippines, either the Japanese conquest of the islands in 1941-42 or the American return and re-conquest of the islands in 1944-45. Back to Bataan (1943). Erroneously states that national hero Andrés Bonifacio fought the Americans (he was killed before the American invasion); also centres on a fictional grandson of his. Daughters of Satan (1972), an American Gothic Horror film set in Manila, starring a really young Tom Selleck, and involving witchcraft and a Creepy Changing Painting. Also starred some veteran Filipino actors of the era, including most notably Paraluman, a famous mestiza leading lady who rose to stardom in The '50s. The Bourne Legacy (2012) had a significant sequence set in Manilain-universe, the headquarters of a pharmaceutical corporation connected to the CIA's Super Soldier program. There's also a sailing scene set in the waters around Palawan island. Ilo Ilo (2013), an award-winning Singaporean film about the Filipina maid/nanny of a Singaporean family from the author's past. The film is named for her province of origin. Metro Manila (2013), a British production starring a poor provincial family coming to, well, Metro Manila (the nation's capital), seeking work. Los últimos de Filipinas (Spain, two versions: 1945, 2016)about the Spanish empire's last stand against the Filipino Revolutionaries of 1898, at the Siege of Baler. Rosita (2016), a Danish production starring Filipina actress Mercedes Cabral as the eponymous Rosita, a mail-order bride to an older Danish guy. It gets complicated when the guy's son (who acts as an interpreter between Rosita and his dad) also starts to develop an attraction to her. The very little-known Romance & Adventure in Old Manila (1928), a collection of short stories by Walter J. Robb and based on the manuscripts of Percy A. Hill. Both men were American colonials living and working in the Philippines under U.S. rule. Interestingly, most of the stories are about Spanish-era Manila, with most of the cast of characters being colonial governors, friars, military men, dons and doñas and other Hispanic grandees. "The Filipino and the Drunkard " (1935), a very short story by William Saroyan depicting, well, a Filipino boy working in California, trying to escape from a very drunk, and very racist, white man. The 1936 pulp novel on which Double Indemnity was based originally featured a nameless Filipino houseboy. Naturally, he was cut out from the film. The participants of this tragedy were: two officers, a soldier, two women, a Filipino, and a horse. Fires on the Plain (1951), a Japanese novel about the experiences of a soldier in the Imperial Japanese Army stranded in a Philippine jungle in the last days of World War II. The Ugly American (1958), a novel about the Cold War's effects on Southeast Asia, featured one chapter set in the then-Third Republic Philippines, where all the politicians were Hispanic in name and disposition and American in ideology and leaning, and where a No Celebrities Were Harmed version of CIA manipulator Col. Edward Lansdale proves such a riot among his little brown brothers, who immediately tag him "The Ragtime Kid" as a term of affection. Starship Troopers (1959)it's not popularly known that the protagonist, Juan "Johnnie" Rico, was actually Filipino. The movie whitewashed him into a white Argentine. Biggest Elvis (1996), a novel set in the Red Light District town of Olongapo near the (former) U.S. (neo)colonial Subic naval base, and focusing on three Elvis impersonators. My Hollywood (2010), by Mona Simpson, had as a major supporting character a Filipina nanny named, confusingly, Lola (in the Philippines, "Lola" is not a given namenot a common one, anywaybut the local term for "Grandma"), who gets hired to take care of the main character, a classical composer, and her son. Moondogs (2011) is a crime/action thriller by Alexander Yates with supernatural elements, revolving around the kidnapping of an American businessman in the Philippines. Yates did grow up there and worked at the U.S. Embassy in Manila, but he is Caucasian with solidly American origins, and studied at the University of Virginia. Avenue of Mysteries (2015), by John Irving, has its Mexican author-protagonist Juan Diego take an extended stay in the Philippines to fulfil a promise to a childhood friend. The Crazy Rich Asians trilogy features a few, though they're not terribly front-and-center, including the Ayala couple in China Rich Girlfriend (presumably based on the Real Life Ayala family in the Philippines, of Spanish-Basque descent), and one chapter in a Filipino oligarch's house and another set in Palawan island in Rich People Problems. Trivia Veteran Filipina actress/TV host Kris Aquinowho herself belongs to a family of "crazy rich Asians" (namely, the landowning Cojuangco family of Tarlac province in central Luzon, of Chinese descent, who spawned two Philippine Presidents in the personae of her mother and brother)cameos briefly as a Malaysian princess in the film adaptation of the first book. Interestingly, however, another Filipino actor plays a much larger, though also supporting, and non-Filipino roleNico Santos, best known as the (also-Filipino) Mateo in Superstore. H+ Incorporated (2018), by Gary Dejean, is set in a Dystopian-future Manila (though it's not like it's not dystopian now). Brief Chronicle of Another Stupid Heartbreak (due out 2019), by YA author Adi Alsaid, has a Filipino-American main character. Café Americain, a largely forgotten 1990s sitcom on NBC, had as part of its main cast a deposed dictator's wife named Madame Ybarra, a close Expy of Imelda Marcos. Even without knowing the Real Life inspiration, one could assume that Madame Ybarra may be canonically Filipino to begin with, since she was played by an Asian note but not a Filipinothe East Asian Jodi Long but had a Spanish/Basque last name (though it's probably her husband's). note Ironically, Ferdinand Marcos had little, if any, actual Spanish descentat most, some Chinese lineageand in the Philippines, Basque surnames are often far more indicative of actual Spanish/Mediterranean descent than the other Spanish surnames, primarily of Castilian origin, which were imposed on a largely indigenous populace for tax and census reasons. Of course, it's also entirely possible that the creators simply invented a Fictional Counterpart of the Philippines instead, with stand-in place names as well as people names. The specifics of Madame Ybarra's country of origin don't appear to be terribly essential to the story except as supporting comic relief, so historical or geographical accuracy was probably not a going concern. The Chinese series The Legend of Bruce Lee prominently featured Dan Inosanto, the Fil-Am martial arts instructor and legend who became one of Bruce Lee's mentors. Much of the show was also rather fictionalised, however, notably introducing a sort of "stand-in" Filipina character, a big fan of Bruce Lee who almost became a Love Interest, and who was only ever addressed by her (presumably) last name, Arroyo. note One suspects she was likely named after former Philippine president Gloria Macapagal-Arroyo, especially when one notices that Bruce Lee's other friends/allies in the series include a British guy surnamed Blair (as in Tonythe former UK prime minister) and a black American police officer surnamed Rice (as in Condoleezzathe former US Secretary of State under the second Bush administration). Those telling names have the effect of making that show very easy to date to the mid-2000s, when all the Real Life sources of these names were in power. One of the main characters on Grimm was the Chinese-Filipino-Americannote Chinese Filipino by ethnicity, but of course a U.S. citizen Sergeant Wu, whose actor Reggie Lee has a similar background. In the episode "Mommy Dearest", S3E14, he encounters an aswang, a Filipino supernatural creature in some ways akin to a vampire. Crazy Ex-Girlfriend has Josh Chan, the Filipino-American leading man to whom Rebecca is the show's eponymous "crazy ex-girlfriend". The Good Place has Jason Mendoza, an Asian Airhead DJ posing as an unspeaking Buddhist monk named Jianyu. Superstore has Mateo Liwanag, who's both Filipino and gay. Make It Pop has Fil-Canadian Louriza Tronco playing Jodi Mapa (or Mappa). It's assumed Jodi has at least some Filipino blood as well, though all that's confirmed is that she's part-Jewish. Lulu, played by Ashley Argota, on True Jackson, VP, but like with Jodi in Make it Pop above, it's not clear whether Lulu is Filipino in-universe. Glee once featured a Filipina exchange student named Sunshine Corazonplayed by pop star Jake Zyrus, at the time known as Charice prior to coming out as a transgender man. A two-episode arc in Season 2 of the Spanish series The Ministry of Time depicts time-travellers witnessing and participating in the 1898 Siege of Baler (but from the Spanish side, natchas with Los últimos de Filipinas, as previously mentioned). One episode in Madam Secretary featured a state visit from a Philippine president whose rough mannerisms were very clearly patterned on those of the current (as of this writing) President, Rodrigo Duterte. The 1987 season had white actress Jan Hooks satirising then-Philippine President Corazon "Cory" Aquino. The 1988 season then satirised Imelda Marcos, wife of ex-dictator Ferdinand Marcos (a few years before her lampooning in Café Americain). Also played by a white actress (Nora Dunn). The parody of the 2016 U.S. vice-presidential debates had Latina comedian Melissa Villaseñor playing Elaine Quijano, the Filipino-American debate moderator. That episode in season 6 of The Middle where Sue had to dance the tinikling (a Filipino bamboo dance) to get enough class credit. Anthony Bourdain: Parts Unknown once featured a Manila episode with all the expected Filipino food. It's all the more relevant for the late Anthony Bourdain because he had close family friends from there. Plus, his trying the local fast-food chain Jollibee has become something of a Memetic Mutation. Singaporean thriller P. I. stars Filipina celebrity Karylle as a pole-dancing Private Detective named Maia Yap. She could just about pass for a Singaporean, but it's mentioned her dad's based in Tagaytay, making it likely that she's at least Chinese-Filipino in-universe. Season 2 of American Crime Story is Based on a True Story of the murder of fashion designer Gianni Versace by the Filipino-American Andrew Cunanan. which Sabrina solves years later, causing the demon to attempt a break-out. The play is in fact about the U.S. colonial invasion of Sulu, only Played for Laughs. Across the pond, the British Florodora is about, and named for, a tropical flower growing on a fictitious Philippine island, which also gave its name to the commercial perfume produced in a local factory. Josie Rizal from Tekken 7, her name being a thinly-veiled reference to Jose Rizal. Tanggal , a Swedish-produced horror game based on Filipino mythology. Malaya, the main character of How to be a Werewolf, and her brother Vincent, are half-Filipino from her mother's side. Truth in Television: Mighty Whitey and Mellow Yellow pairings like their parents is actually not an uncommon pairing. On Bloody Urban, which includes vampires and other supernatural creatures, supporting character Shaun is an aswang, as evidenced by his long bloodsucking proboscis. Also predates Grimm's depiction by some years. Notably sort of an inversion of the case in How to be a Werewolf, wherein a partly-Filipino character becomes a (generally) Western mythical creature, while here the creature himself is of a type "endemic" to the Philippines. The Aswang Project, a website and YouTube channel documenting Philippine mythology started and mostly run by the Canadian Jordan Clark. Motorcity had Texas, The Big Guy of his team. One episode of Steven Universe featured an ube (purple yam) cake. Word of God later confirmed that Lars, the character who baked it, is actually of Filipino descent. Janna Ordonia on Star vs. the Forces of Evil. The titular Rick, Steve's 30-year-old Fil-Am husband, on Rick & Steve: The Happiest Gay Couple in All the World.